It's Friday and that means I made it through my first week alone with the twins. 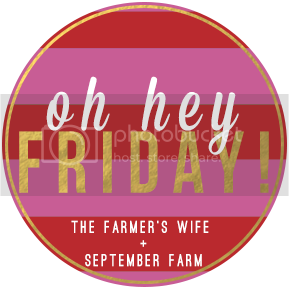 It also means that I get to actually post something to Oh Hey Friday link up with Karli from September Farm. As I sit here and type this post, I am staring at two sweet sleeping babies. 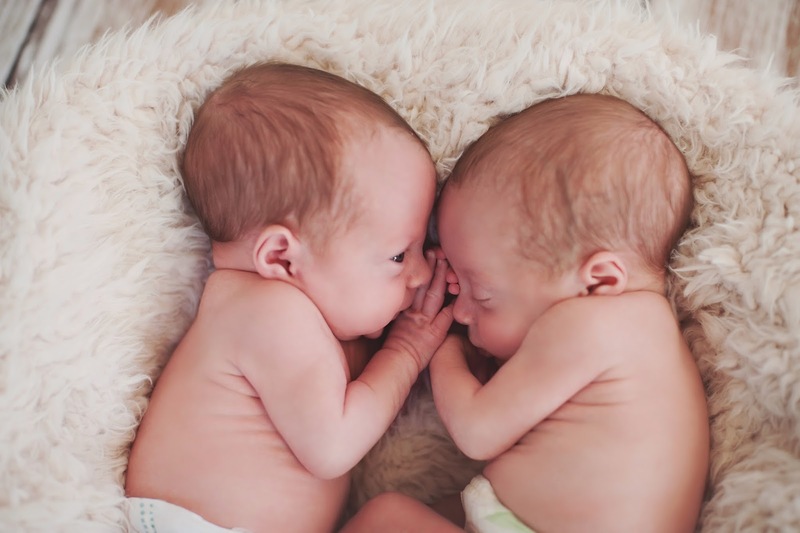 Everything lately on my blog has been about being a new mommy or the cutest little twins there ever was. So I thought I would take a break from that today (sorry no cute baby photos today) and write a post on Spring/Summer things I am dying to buy. This momma is trying to get her body back and transitioning into a "normal" body. I have lost all my baby weight and only have a slight belly left from being pregnant. I fit into my old jeans and even bought a pair of jeans (ok my dear husband bought them for me) of new jeans in a size smaller. The c-section saved my hips from being stretched out. I guess that is one good thing about a c-section. But I have been eying new bathing suits, skirts, dresses and shirts to bring me into the new seasons. I was pregnant from May to December, so my wardrobe is lacking in fun new cute things. I posted more than five things that I want and my list could go on for days, but I will stick to the seven that have my sitting in my shopping cart for days. New jeans, a gorgeous bikini, shorts, two springy shirts and a cardi for the still breezy days. Hopefully I will pull the trigger on some of these soon. My wardrobe sure does need an update (hint hint husband). 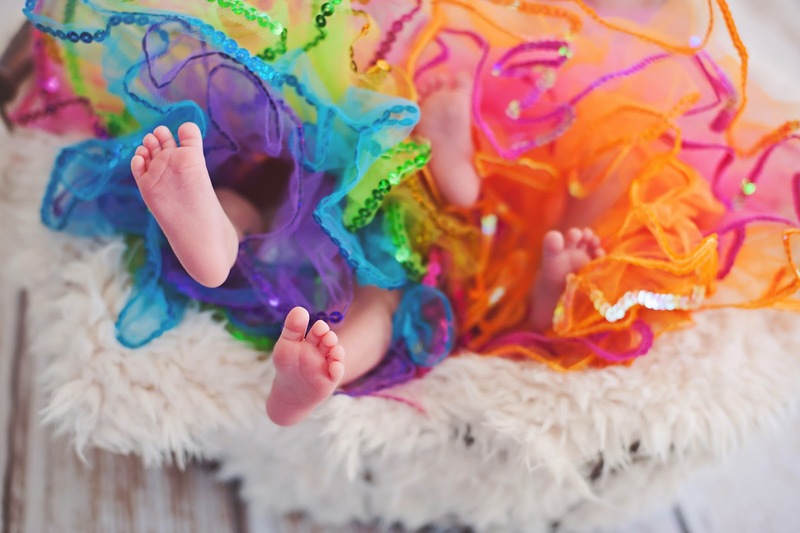 We were so fortunate enough to have a friend gift us a newborn photo shoot for the girls. I couldn't wait to get pro pics done to showcase our beautiful baby girls. I never got the opportunity to do maternity photos because I delivered so early. I guess I should have listened to everyone when they said to get them done at 7 months. Oh well, maybe next time, if there is a next time. 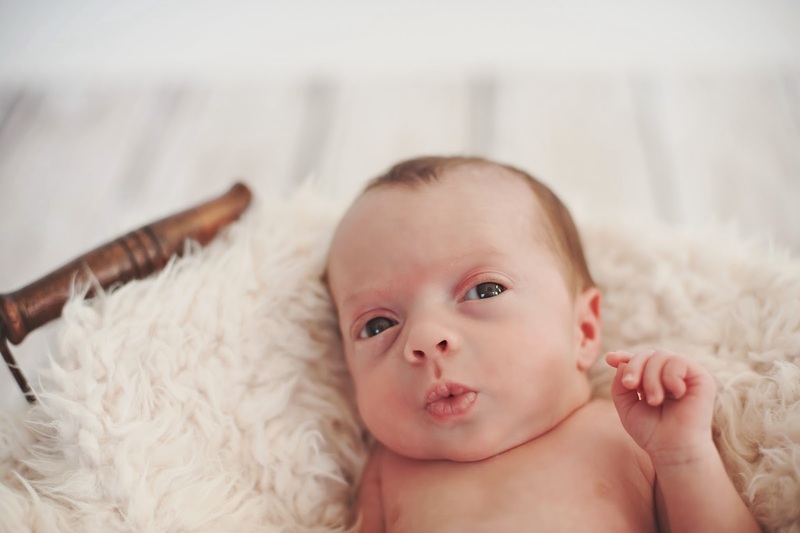 So I knew I had to have newborn photos done ASAP. 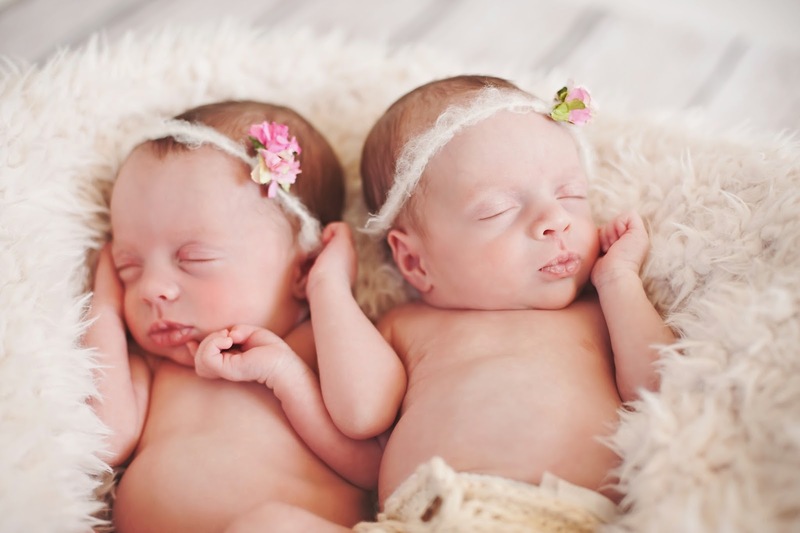 But then the girls spent a lot of time in the NICU (26 and 27 days to be exact), so while these aren't quite newborn photos, the girls look like newborns in them. So without further ado, here is a sampling of my baby girls. So I know I haven't been around these parts lately. But now that I am alone with the girls for the next 8 weeks, I plan to really focus on my blog while my darlings sleep. Life has been pretty good to us lately. We had daddy home for three weeks which meant lots of trips out to breakfast and Target. I love going to Target and we must have been several times a week. I wasn't complaining. Then daddy went back to work last week, but my sweet mom came to the rescue and helped me take care of the babies. Not only is my mom a rockstar when it comes to anything babies, but I got to have real adult interaction all week. And she even prepped meals for us all week. We truly won the lottery with having my mom help us. The girls love their grandma so much. But now I am on my own. First feeding down and many more to go. Luckily, my dear husband is going to take over parenting duties after work so this momma can get a massage and facial. Not a bad way to break in my first week alone with the girls. And speaking of the girls, they are getting so big. I am not sure how big as we have their 2 month pediatrician appointment tomorrow (shots and all), but they have developed so much. We finally took their newborn photos 2 1/2 weeks ago. Better late than never, right? The girls are 40 1/2 weeks technically, but they have been "born" for 8 weeks now. I can't believe it has been 8 weeks with my precious babies. Life surely has changed, but for the better. I plan on doing a 2 month update later this week, but in the meantime, check out what the babies have been up to lately. Who is on the left and who is on the right?? 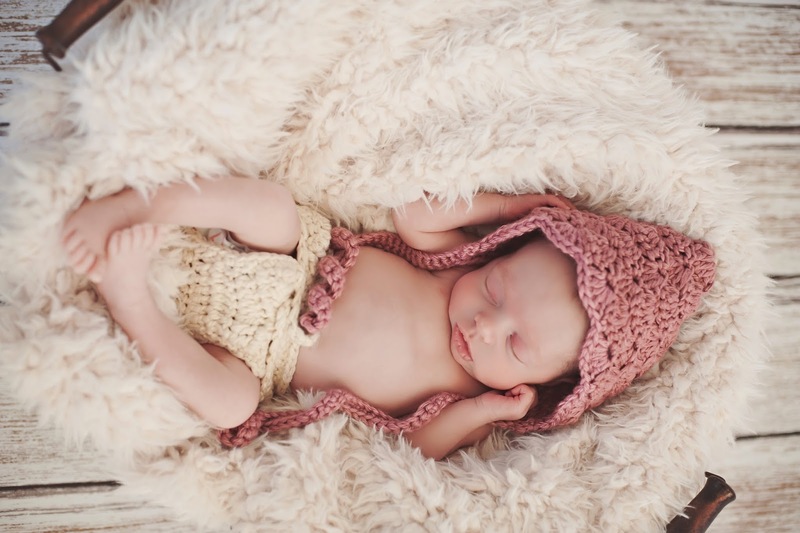 And here is a sneak peak of their newborn photo shoot, which I plan to post photos this week. Promise. 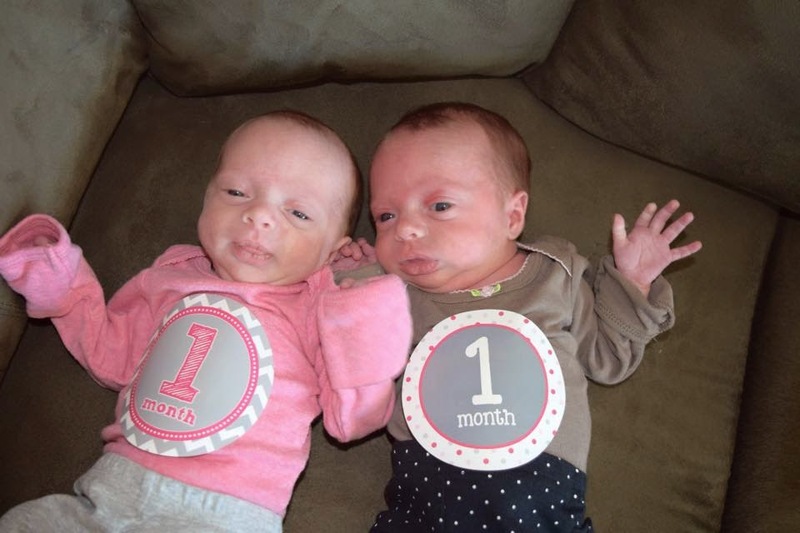 So I know we are a few days late, but my baby girls are already over a month old. Time sure does fly. On that note, please slow down because I need to savor every moment of these girls lives. weight: At the girls pediatrician appointment on January 28th, Avery weighed 6 pounds 1 ounce and was 19 1/2 inches. Sutton weighed 5 pounds 6.1 oz and was 18 3/4 inches. They are getting bigger and bigger everyday! sleep: The girls pretty much sleep for two hours between feedings. They are starting to stay awake more and more which is exciting to be able to play with them and see their personalities develop. Other mommies, when can we start cutting out the 2 am feedings? eats: The girls are big time eaters. They currently eat/drink my breast milk (and have been since they were born) and have a supplement of two neosure feedings per day. This is to make sure they continue to gain weight. I am pumping for them right now and we are doing about one breast feeding session per day per baby. The girls are working their way up to taking the breast full time, but haven't gotten their yet as they are still premature babies. It will be great once they are on the breast full time! loves: I would say they love their mommy and daddy right now. They love looking around and exploring what our house and the world has to offer. dislikes: They love the bath, but hate when we take them out of it. Talk about loud screaming. They also hate their diapers being changed, but what baby doesn't? We are beyond fortunate to have such sweet baby girls and pretty quiet baby girls. I think they really learned a lot in the NICU. From self soothing to eating well, our girls are on track or ahead of the game. And to think they are now 38 weekers (gestationally), but have been with us for over a month now. 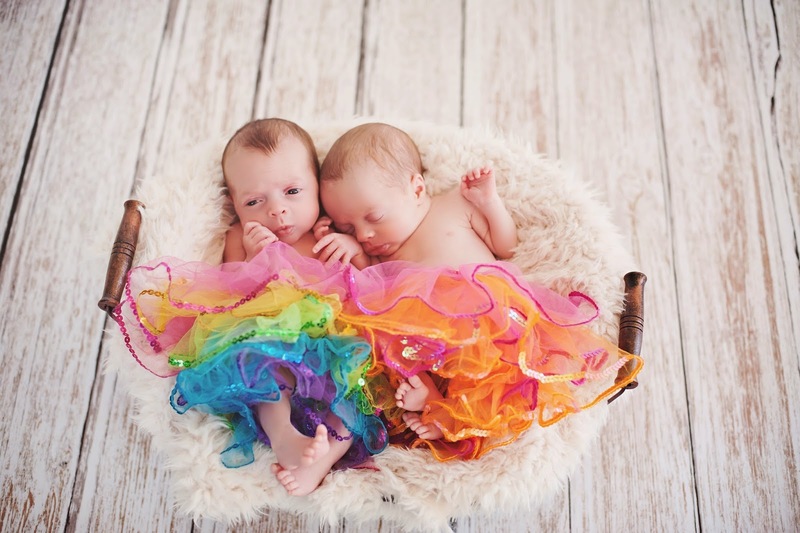 For Part 1 of Sutton and Avery's Birth Story, click here. We left off with my husband and I, my nurses and my doctor making the decision that I would need an emergency c-section. A decision I knew could happen while planning my birth preferences, but something I never intended on happening. Once my ivy was in and everything was prepped in the OR, they wheeled me down. My husband walked by my side telling me he loves me and that we would get to meet our girls so soon and he was so proud of me. That husband of mine, let me tell you, he is the best thing to ever happen to me. He is my rock. He watched everything happen and kept it together. He was there for me and for our children. He is far from being selfish. I love this man more than life itself. 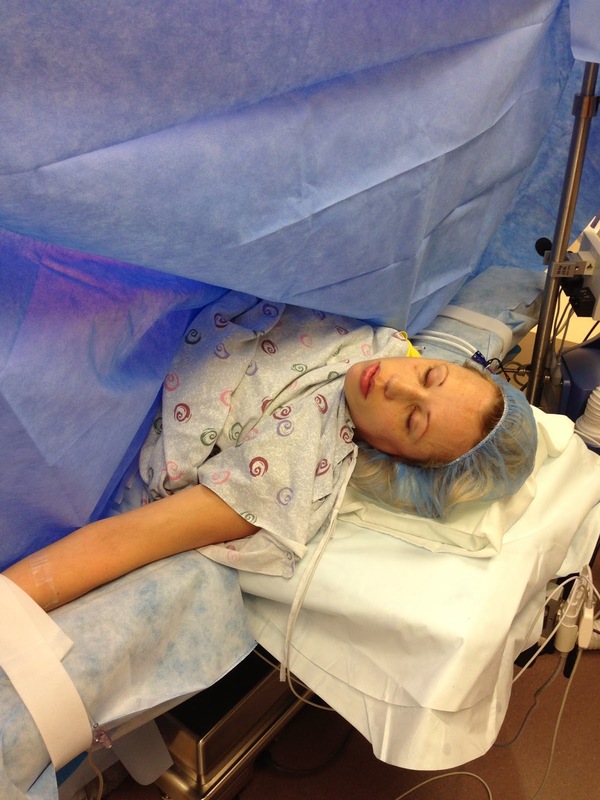 Once I got into the OR, they had me get on the operating table. Let me tell you, it was really cold in the OR. I kept asking for a blanket, but had to wait until I got my spinal. They had me sit on the edge of the table and hold onto my nurse. I put my head on her shoulders and wrapped my feet around her calves. And I waited and waited while shaking. It took about 15 to 20 minutes to get everything prepped for my spinal. Then it was go time. I had to sit still, really still, so the anesthesiologist could give me a local and then the spinal. I could feel the spinal, but it wasn't as painful as I thought it would be. Then they helped me lay down and asked if I could feel anything. We waited for the spinal to work and then I asked where my husband was and to not start without him. Soon enough they brought him in and he kissed my forehead and said soon we get to meet our little girls. Now my husband said he didn't want to look over the curtain (this was when we had our talks about labor and delivery before), but when it was go time and he was asked by the doctor, he said yes. So my husband talked to me, kissed my forehead and watched our girls come into the world. Now I don't know exactly what all happened while having my c-section as parts are really fuzzy, but the rest of the story is from my recollection and my husbands account of events. And warning, the pictures are sort of graphic. The doctor told me they were making the incision and my husband looked over the curtain. Not much time passed and they pulled out Sutton Kira Butler. Sutton cried immediately and she passed her apgar with an 7 and then an 8. She was happy to get out of mommy's belly. 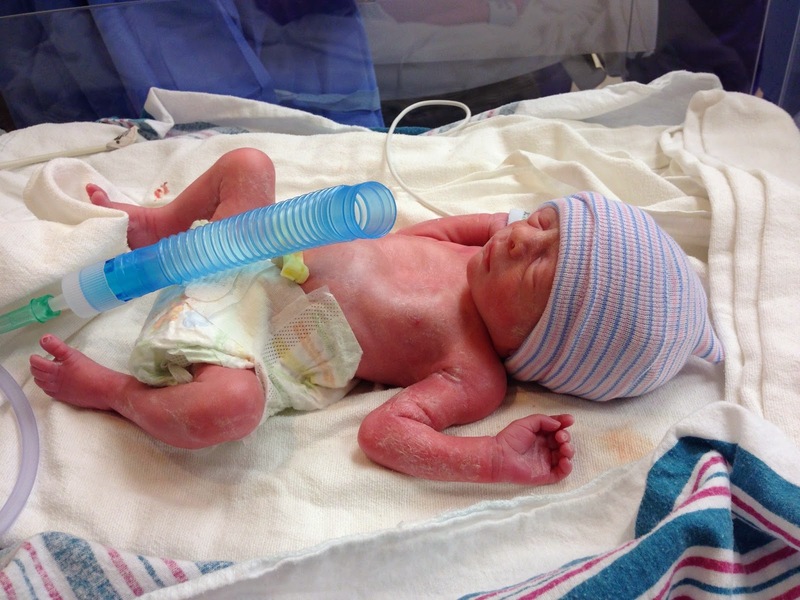 Sutton was born on December 29, 2014 at 2:37 am weighing 3 pounds, 15 oz and 17 3/4 inches long. Next up was Miss Avery. 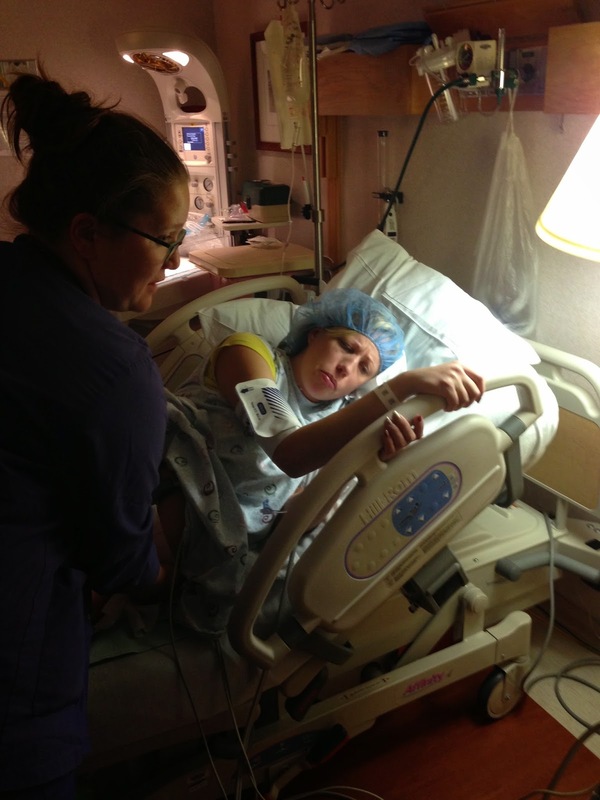 Now Avery was way up in my rib cage area and not so ready to come out. But within seconds of taking Sutton out, Avery Madison Butler came into this world. Avery was born on December 29, 2014 at 2:37 am weighing 4 pounds, 8 oz and 17 1/2 inches long. Avery took a few breaths and let out a cry, but then she had some trouble breathing. The nurses said she had an apgar of 5, then 6, then 7, but she had to be revived a bit (breaks my heart). My husband then went over to the girls to cut their umbilical cords. Next it was time to deliver my placenta. At this point, I was asking a ton of questions about the girls and asking if I could see them. I could only see Sutton's incubator at this time and a bit of her, but I couldn't see Avery. Also I knew something was wrong from the look on my husband's face and the anesthesiologists face. 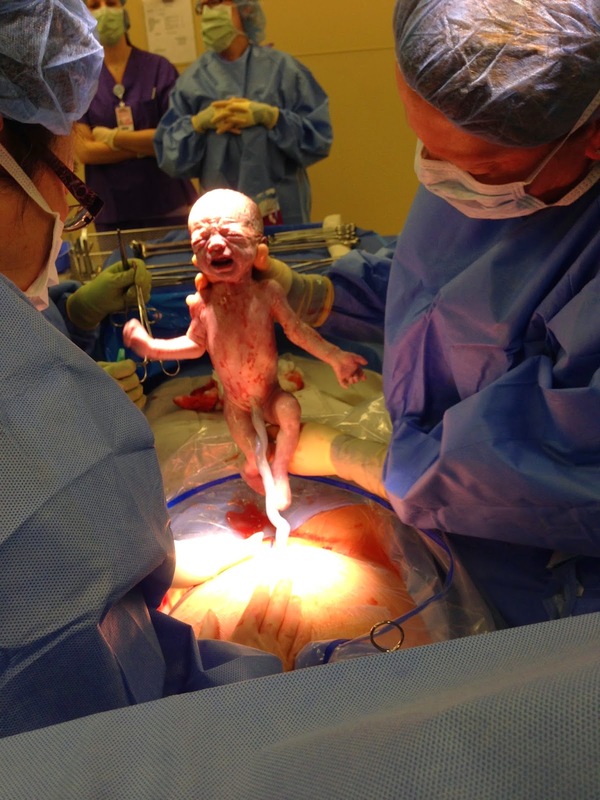 My placenta broke inside, so they couldn't save it for us. We wanted to dry it out and put it in a pill form, so I could take it to prevent/help with postpartum. But when my husband asked about it, they said it had to go to pathology since it broke inside. Once they got it out, they pulled my uterus outside of my body to massage it. They needed it to contract and it wouldn't. My husband said this was pretty gross to watch considering my insides were on the outside. I went in and out of consciousness at this point. I was losing a bunch of blood, over 2 liters to be exact, and the anesthesiologist kept giving me shots in my shoulder and put another ivy in my right hand. I must have had at least 10 or more shots in my shoulder. I remember hearing them say they might have to do a hysterectomy if they couldn't get my uterus to contract. I closed my eyes and remember saying/thinking, I am going to die. I have never felt so scared in my life. I have never felt so weak in my life. I felt like I was slipping away. I was unconscious at one point and my anesthesiologist kept waking me up saying I needed to stay with him. All the while, my husband is watching this go down. He has me losing a lot of blood and his babies are about to be wheeled off to the NICU. 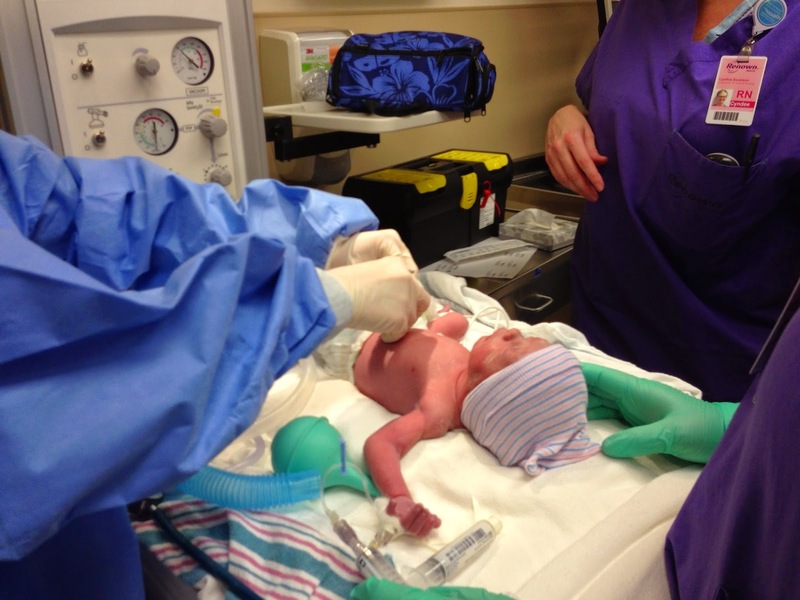 The anesthesiologist told him he needed to go to the NICU with the babies. I remember hearing this and my husband asking if he should go or stay with me. The anesthesiologist told him to go. And so he went. They were still working on me and I was still out of it. Eventually they got my uterus to contract before having to take it out. Thank god. I am so happy they saved it because we may want more children and I want that option. I am so grateful the doctors did everything they could to save me and my uterus. I only vaguely remember them transferring me from the operating room to the recovery room. But once I was in recovery, my husband came in, and he came in with ice chips. So happy for this as I was so dehydrated. After awhile, my mom came in to see me and I started to feel better. Maybe it was the demorall and morphine shots they gave me to stop shaking. Either way, I started to feel better. Well other than when they check your uterus and push on it to make sure it has contracted. Ouch and they do that every hour. That hurts so bad! We stayed in the hospital for 5 days. And in those 5 days, I lost all modesty, gained two new baby girls, also gained a new love for my husband as a daddy, and experienced a whole lotta love. This wasn't exactly the labor/birth I imagined, but it got my babies here safe and sound. And if you read through the whole two parts, way to go. I guess the girls birth story really starts on Friday December 26, 2014. We had dinner at my aunt and uncles house (in-laws) in Truckee that evening and when we were driving home, I started to feel some pressure and was more uncomfortable than usual. When we got home, I tried to go to sleep, but the pressure and achiness was too much. There were tears, lots of movement and lots of trips to the bathroom. Nothing was working. My cousin, Ashley, had given me some benedryl for the itchiness and sleep, so I decided to take one. This was after about an hour of my husband rubbing my back and me in pain. I went to sleep and thought maybe my uterus is still expanding. I was only 33 weeks, 2 days, so there was no way this was labor. Saturday we went about life as usual and nothing happened. Sunday we did the same. We even ran to Target to pick up some of our hospital bag toiletries and said we would pack up that week just in case and get the carseats installed too. Rory and I had dinner together at a little Taiwanese place, grabbed our pup and headed to his parents house to have dessert and hang out with my brother and sister-in-law before they left the next day. While we were hanging out, I started to get uncomfortable. Just moving around a lot mostly. We decided to head home and on the way, I felt a pop of movement. Like one of the babies rolled over or something. Then there was some relief, but the pain started to come slightly. We got home, got ready for bed and I had a bit of blood (slight tiny tinge) on the bathroom tissue, but let it go. I fell asleep for maybe a half hour to be woken up by pain. It was pretty constant and more painful than Friday's episode. I was constantly trying to go to the bathroom, lay down (which hurt the worst), sway back and forth, cry, get down on my hands and knees and ride the pain out. I couldn't tell if these were contractions because there was just a lot of pain almost the entire time. I would have some relief occasionally, but not enough to think it was contractions. I seriously thought I just had bad gas or constipation. Then I went to the bathroom once again and more blood on the toliet paper. I told Rory that I thought we should go to the hospital just to get it checked out, but that I would be embarrassed if it was just gas and I was sorry. So we grabbed a few things. My husband grabbed my iPad, my purse, my shoes, changed himself, gave a treat to our pup and we were off. We never got the chance to pack a bag which I was really sad about because my sister got me the weekender bag I wanted (Herschel Supply Co. Ravine Weekend Bag). At 11:15 ish off to the hospital we went where I could barely sit in the seat. I tried laying down the seat, tried moving around in the car and moaned in pain the entire 10 minute drive. Once we got to the emergency room drop-off (also where you go if you are in labor and it is after 10 pm), I took off out of the car to get in a wheelchair. My husband wheeled me to labor and delivery. I could barely stand up, let alone answer the questions I was being asked. Instead of taking me to assessment, they took me to a delivery room. The entire time, I kept asking for water because I was so thirsty, but they said they couldn't give me any yet. 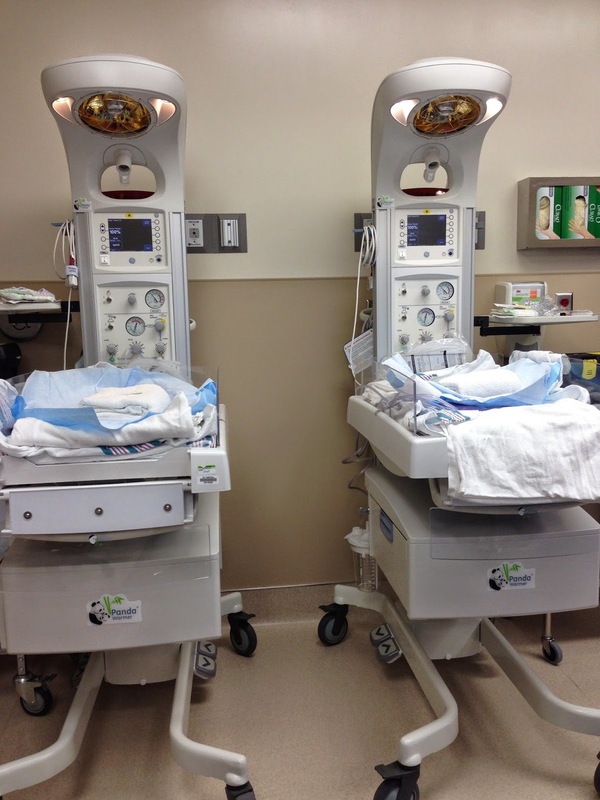 They needed to monitor the girls with the fetal dopplers and do an ultrasound to see the positions of the babies. I told them I wanted a vaginal birth and they said they would do everything they could. They paged my doctor and started the process of seeing where I was at. The babies heartbeats were great. I am surprised they could get a read since I was constantly moving and changing positions because nothing felt good. They checked me and I was a 4/5 and 100% effaced. There was no turning back. These girls were going to be born soon. An ultrasound revealed baby A (Sutton) was head down and dropping. She was ready to go. But her little sister, baby B (Avery) was still cozy up in mommy's ribs sitting transverse (sideways). 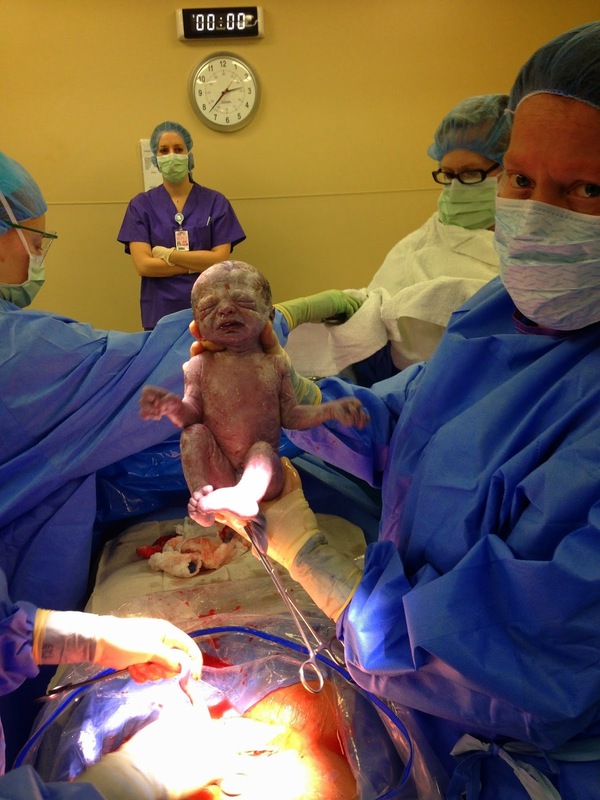 They said it is risky to delivery a baby that early that is transverse because they weren't sure if they could get her to turn. At this time, they checked me again and I was at 9 cm dilated. We talked our options, and c-section it was. Emergency c-section. I was devastated. Lots of tears. This is the face of pain. I am not a cusser, but I did manage to cuss quite a bit while being assessed. Man oh man, did the pain hurt. And that is my lovely nurse who helped me keep it together. I was telling my husband to call our family and that I needed him there. That I loved him and I was so sorry the girls were coming this early. We are pretty sure my labor started Friday and maybe we could have stopped it if I had went in, but we can never be sure. And this is the way God had intended us to bring our little girls into the world. Stay Tuned for Part 2 of Sutton and Avery's Birth Story. I know it has been awhile, but I wanted to give a quick update on the girls and why I have been absent once again...THE GIRLS ARE OUT OF THE NICU! Friday, January 23rd, we were told we could do the overnight stay with Avery and take her home on Saturday, January 24th. That night was scary and exciting all at once. We stayed in the hospital once again in the postpartum floor. But this time we had this sweet bundle of joy with us. I don't think we slept much that night as we stirred at every sound Avery made. But we made it through the night and she gained weight, so Saturday around noon, we took home Baby B, aka Avery. 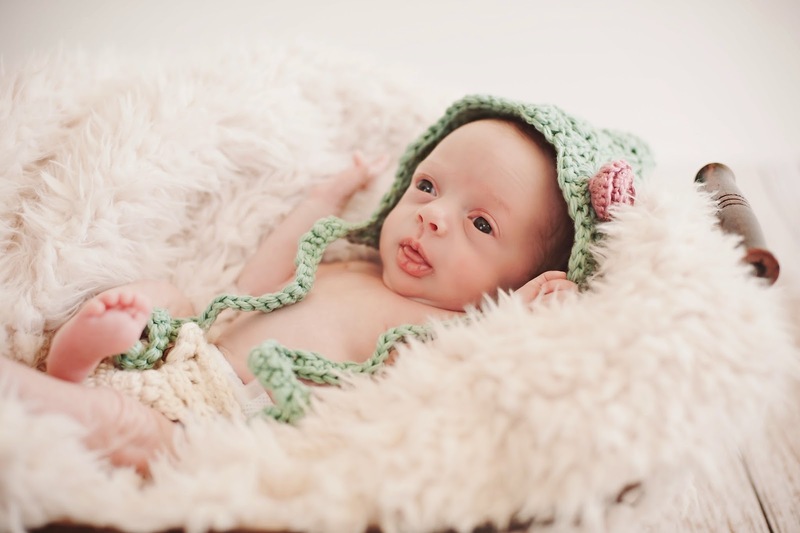 Avery was in the NICU for 26 days. That first night at home with Avery was better than the hospital stay sleep wise, but every night gets better and better. Having Avery home first gave us a chance to get settled in, see how feedings and pumping at home would go, and give us a chance to see what it was like being parents for the first time (really feel like parents and not part time parents). But that wouldn't last too long because Baby A, aka Sutton, came home on Sunday around noon herself. 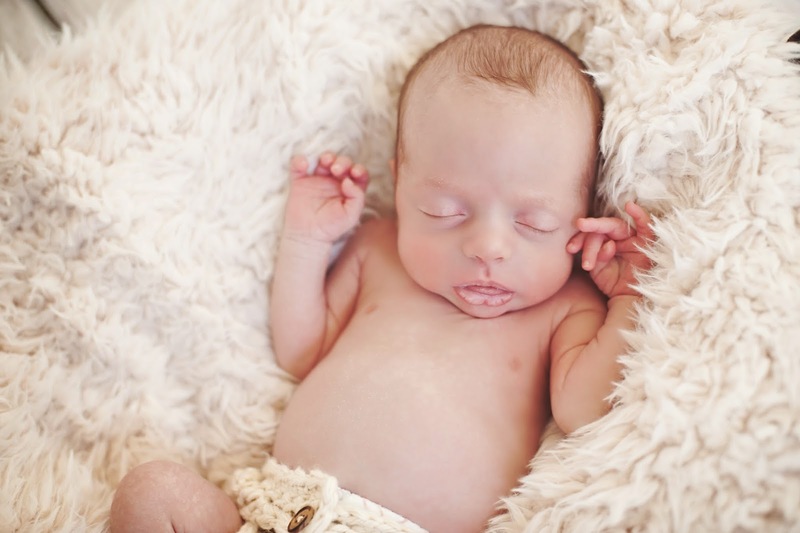 Sutton was in the NICU for 27 days. So now we have two babies at home and life is chaotic, but so sweet. We are getting used to those awful 2 am feedings, but there is nothing better in this world than those sweet baby girls. I am in love beyond anything I have ever imagined and I finally feel like a true FULL TIME mommy. And so they are the reason I am once again slacking in the blogging department. 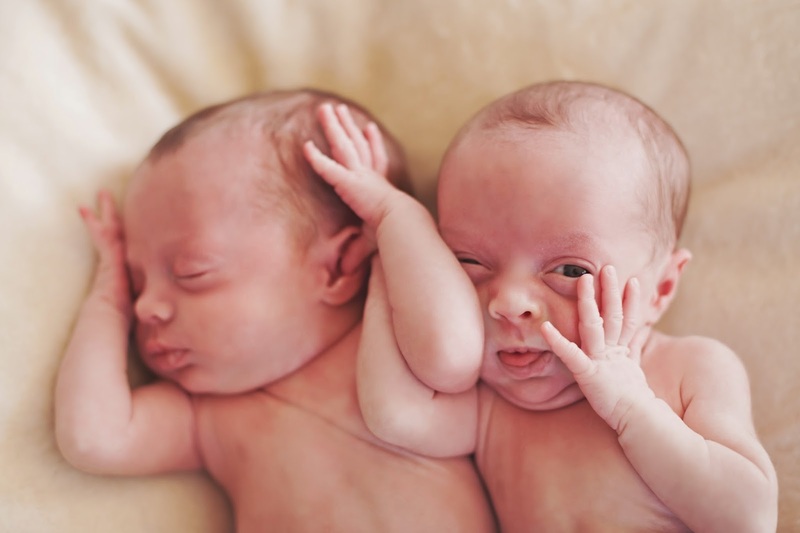 But I did finish their birth story today, so get ready for Part 1 tomorrow and Part 2 on Wednesday. 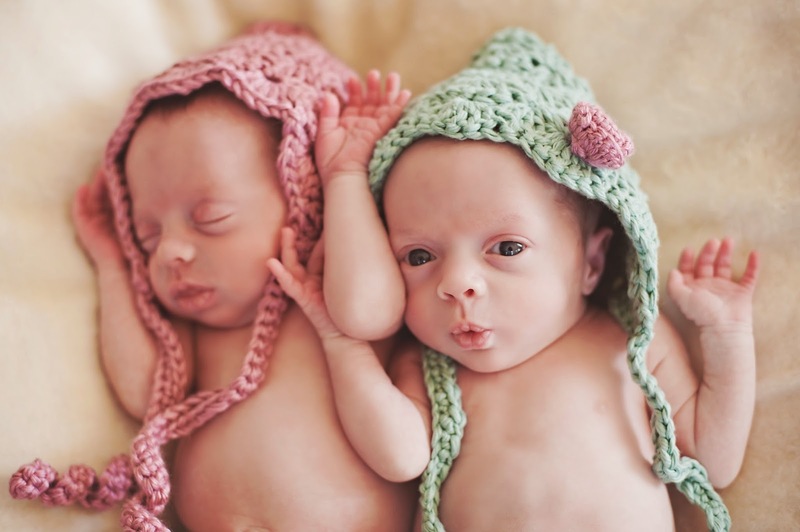 Also, I hope to write their one month update as they turned one month on January 29th! So stay tuned.